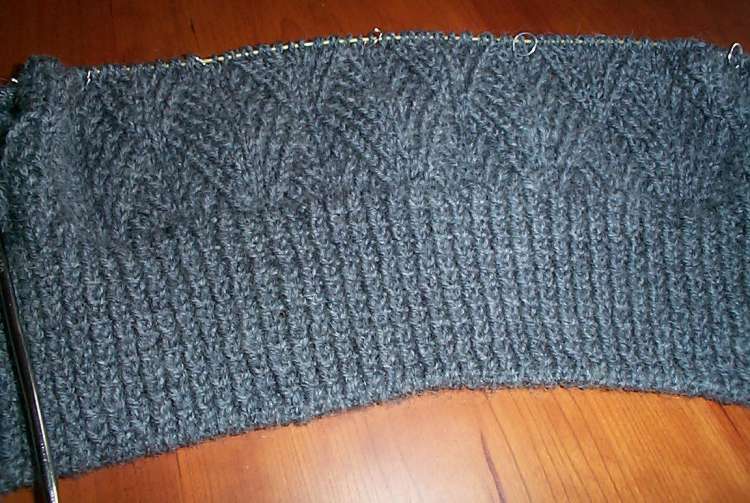 You can see the wide twist-rib section; the tubular cast-on I used (my fave); and about 80% of the first full pattern row repeat. I’ve described the tubular cast-on before. You can also see the beginnings of the soft drape of the body, with just a bit of blousy fullness above the ribbing. My gauge is just a squidge looser than that recommended, but I am not worried about fit. I am at the top end of the pattern’s presented range of sizes. A bit more fullness won’t matter. Plus I have plenty of yarn. Two whole bags full – about six balls more than the pattern projects. On the Jaeger Matchmaker DK, I can confirm my opinion yesterday. It’s soft. Very soft. Also a bit splitty for this particular use. I’d probably recommend a crisper, more tightly spun yarn for maximum texture effect, but this one is serviceable for the purpose and I like the hand of the fabric that’s resulting. I am a bit disappointed in quality though. I’m only on my second ball, and I’ve found more than a half dozen spots where a ply was spliced. No whole strand knots, but lots of repaired ply breakage. Most were large enough to be noticeable and I ended up cutting them out. That means more ends to end off. Also, I suspect that the luscious softness of this Merino yarn will display a typical weakness – pilling. I noticed that when ripping back, the yarn looks more used and fuzzy than I would normally expect. It mates with itself an exceptional amount for a superwash. All that easily encouraged surface fuzz usually bodes badly for pilling down the road. I’ll keep an eye on that. In the mean time, I’ll be taking a computer vacation for a couple of days, and will catch up with both wiseNeedle and String after the holiday. If you’re in the US – may your long weekend be a pleasant one whether it be away with family or cozy at home. If you’re overseas, were my house to be big enough, I’d wish I could invite you all over for dinner. If the DK is a merino — I agree with the pilling aspect. I’ve lost my love affair with supewash merino for socks. The finished socks need TLC or they pill. Pity — I adore knitting with superwash merino. And oh, how it feels on the skin.